Come join us for an evening of song, chant and healing at the new barefoot shul, Zimrat Yah, in Grace Lutheran Church, 3869 State Street, Santa Barbara. 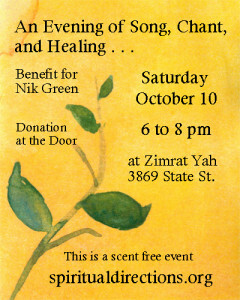 This is a benefit to help Nik Green in his healing journey with cancer, to help cover costs of extra supplements and treatment. This is a scent free event: no perfumes or scented products. Donations will be collected at the event. You can donate online privately if you wish here: http://www.theawayteam.com/nikbeatscancer.htmlAlison Zuber and Gwendolyn McClure will be guiding the event. Alison Zuber is a neurodevelopmental movement therapist and the Spiritual Director of Zimrat Yah. Dr. Gwendolyn McClure, who developed the therapeutic modality of vocal sound healing, teaches courses and leads groups throughout the United States. Nik Green is a Santa Barbara resident, a fantastic musician and recording engineer who has performed and/or recorded with Jimmy Page, Roy Harper, John Sykes, Blue Murder, Barry Palmer, Cougar Estrada, and others. A partial, and somewhat correct discography is online here.